The LCC plans a (Photos: LCC). The LCC has announced firm plans for a major investment program which will see around € 200 million spent in expanding its production capacity over five years. 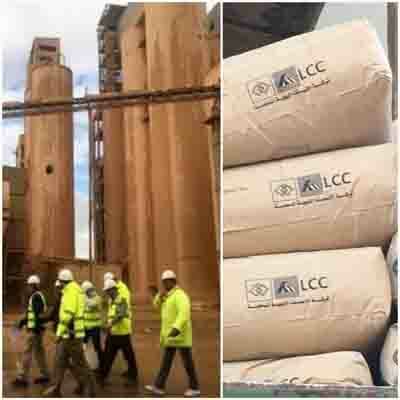 The planning is in the advanced stages, the LCC says, with tenders already issued for the Engineering, Procurement and Construction (EPC) of a mixture of new and upgraded facilities that will increase production capacity by more than 50 percent from around 2 million tons per year to over 3 million tons per year of cement. Financing for the project is close to being in place, the LCC says, with the Central Bank of Libya (CBL), major Banks and Funds and other interested parties having been briefed about the plans during the past 6 months. Applications for approval under Law 9 have also been made to Libya’s Privatization and Investment Board (PIB) who, the LCC says have promised their full support. Approval under Law 9 would afford the LCC tax and customs-free status given by the Libyan state to strategic investments. Chairman and CEO, Robert Solomon said that the LCC is back in business after a long interruption caused by the Libyan 2011 revolution. ‘‘Kilns are turning, mills are grinding, and trucks are rolling out the gates bringing cement to the people of Benghazi for the first time in 5 years. Solomon, said. ‘‘It has been a long hard road to get to this point. And we must be clear, there is still a long, long way to go. But it’s a great feeling to be back’’. ‘‘In February the LCC recalled another 150 employees back to work. We now have over 1,000 workers back in full-time employment. More will be progressively called in months to come’’. The Benghazi factory restarted producing cement on 7 March and both bagged and bulk trucks are going out of the factories’ gates, he added. Solomon said ‘‘these plans will turn the company’s vision to produce 3 million tons of cement a year into a reality. We are the leading manufacturer and supplier of cement in Eastern Libya, and our mission is to maintain that position’’. Solomon acknowledged his team in their Al Fataiah factory just outside of beleaguered city of Derna. ‘‘It is their stalwart efforts that has kept the Company afloat during the dark days and have put us in this position to move forward. The owners and shareholders thank them’’. It will be recalled that the Al Fataiah factory at Derna had continuing to operate over the last 3 years despite the fighting in Derna. Al Fataiah will also benefit from repairs with work on kiln B already underway. All production lines in Al Fataiah will be opened in the second half of 2019, Solomon added. It will be recalled that the LCC had ramped up its efforts to reopen its Benghazi Hawari factory in 2017. The process has been long and costly due to the extensive damage suffered as a result of the fighting that had taken place in the surrounding area.